I rate this one so highly, not because it’s “perfect” as a film. I will happily admit to its flaws, with a concept that requires severe suspension of disbelief, and a $3.7 million budget not up to depicting the last hours of Western civilization. Some aspects have dated poorly, not least the telecommunications department. A phone booth (Kids! Ask your parents!) plays a major part, and then there’s the breeze block-sized mobile phone wielded conspicuously by power-dressing businesswoman Landa (Denise Crosby, just after becoming famous for ST: TNG). By the time it was released in the UK, the Berlin Wall had already come down, and the threat of nuclear Armageddon has never seemed quite the same since, despite the attempts of North Korea to get all nostalgic in this area. It’s not even ground-breaking in its efforts to depict the atomic apocalypse in human terms, but for me, it’s far and away the best at bringing home the impact. No film I’ve ever seen has hit me quite so hard emotionally. The love story at its heart between Harry Washello (Edwards) and Julie Peters (Winningham) is entirely convincing. I bought into it completely at the time, and it’s no less wonderful now, anchored by the fantastic leads. Seeing their happy ending put in peril, when it has barely begun to blossom, is the epitome of tragedy. And if Edwards wasn’t capable of making you believe the central concept – largely by making you believe Harry believes it – it wouldn’t work. I think an important factor in the punch it packs, is that there’s nothing outstanding or special about he or Julie: neither are supermodel attractive, rich or exciting. But their situation and relationship seems all the more real as a result, and there are lines which hit me, right in the feels, with unerring precision. When Harry says, “I think I’ve always been a romantic kind of guy. I just never had someone to be romantic with before,” it resonated with my 22-year old self. And 30 years later, when he says “It’s hell out there now,” and Julie replies, “If you weren’t in here with me – that would be hell,” it resonates with my happily-married self. The script had bounced around Hollywood for years before being production started, making a 1983 list of top unproduced screenplays, and Warner Bros had the rights to it. De Jarnatt used his payment from Strange Brew to buy his script back, not least because he wanted to direct it. At various points, Nicolas Cage, Sting and Kurt Russell were considered for the lead, which would have been… well, let’s just say “different”, and leave it at that. Warner then wanted to re-purchase it and pay De Jarnatt not to direct. But eventually, he got financing from Hemdale, and was able to make it himself, fortunately, with little or no studio interference, which is remarkable considering the content, which is certainly unique. 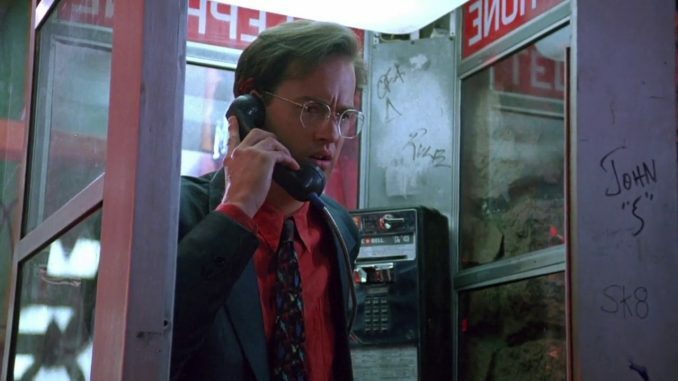 After sleeping in and missing a late date with Julie, Harry is hanging out at the diner where she works, when he answers a call to the phone booth outside. It’s a wrong number – the caller doesn’t immediately realize this, thinking he has reached his father. For he works in a missile silo in North Dakota, and wants to warn Dad that, hallelujah, the missiles are flying – as our hero puts it, “L.A.’s gonna be a desert again very soon.” Harry initially suspects a prank, until Landa uses her connections to discover the threat of obliteration is very real. The race is on for Harry, to rescue Julie and get out of the city before, literally, all hell breaks loose in the form of nuclear fire. Naturally, it’s not an easy proposition and as word of some kind of impending doom spreads, it becomes exponentially harder. All of which would make for a good thriller. 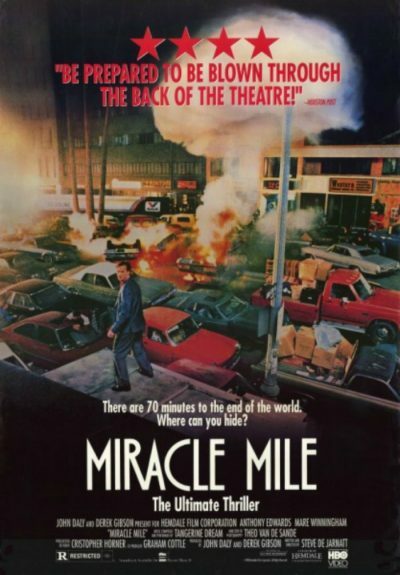 What elevates Miracle Mile to stone-cold classic status is the ending. [SPOILERS FOLLOW] Conventional Hollywood would have our lovers escape, perhaps heading into an uncertain future. That doesn’t happen: just when you think they are about to make it, their helicopter gets EMP’d down into La Brea Tar Pits, by the museum where they first met. They die. The End. [END SPOILERS] I have no idea who thought this was possibly a good idea, and cannot fathom such a bleak conclusion being green-lit in contemporary Hollywood. Yet, I can only thank them, for if the purpose of art is to provoke emotions, then Miracle Mile, to me, must be considered great art. It’s not a film I revisit frequently, if the truth be told, simply due to it being too powerful. It’s not exactly the kind of movie you slap on for light amusement. But having heard discussion of it last week on Sirius, it seemed like the time was right. There’s always risk that a film you perceive as great won’t hit the spot any more: times changes, tastes change and you change. However, in this case, there was no such let-down. About the worst criticism I can level is that there does seem an abrupt shift in direction, the film suddenly moving away from being an ensemble piece about the diner and its inhabitants, when Harry strikes out on his own in search of Julie. Otherwise, it’s as perfect as it was. And, most importantly, still not a dry eye in the house.